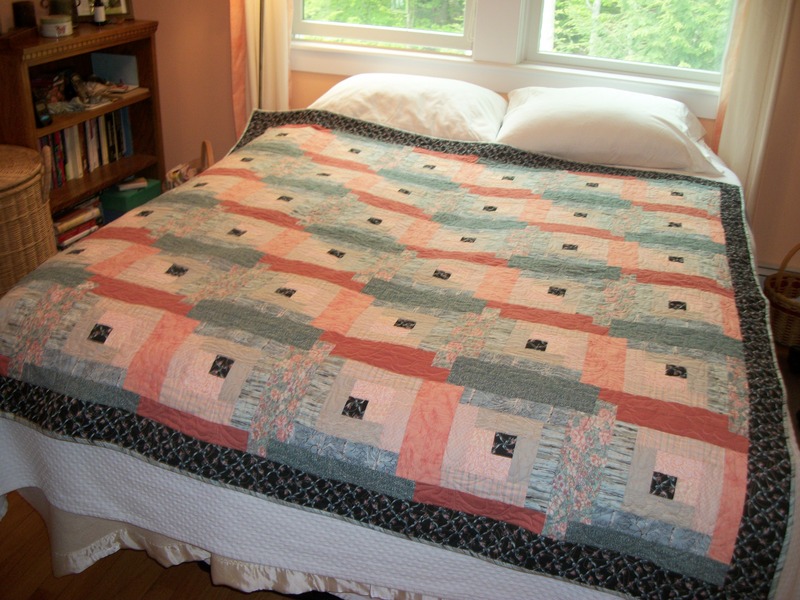 This quilt is done with Victoria Findlay Wolfe’s herringbone braid method found in her book MODERN QUILT MAGIC. And the fabrics are all Cotton+Steel low volume. This quilt has been what seems to me a long time in the making—mostly because I had other projects with higher priorities. 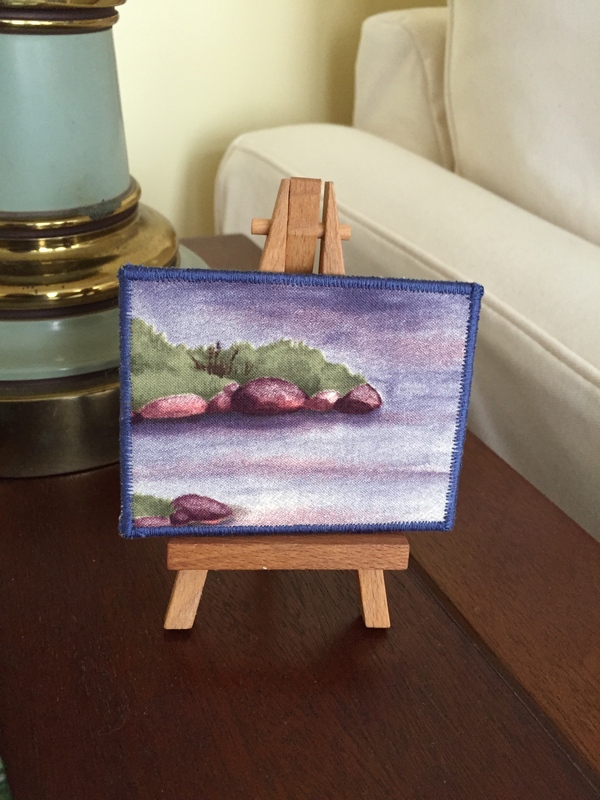 So, this one became a kind of leader/ender project, which I started back in May 2018 at the Coastal Quilter’s retreat. It took some time to get in the rhythm of this method—it’s not hard, just different. And I had a little trouble figuring out how wide and long the braids would be. I went back and added more length to the braids when I realized the quilt was too wide for the length. Next time…I will know. And I suspect there will be a next time, for I really like the texture of this quilt. I started by going through all my Cotton+Steel low volume warm fabrics and ironing each one enough to cut the 2 by 8 strips. (I prewash all fabrics when they first come into the house as the chemicals in them bother me.) So I had a big bag of strips and had a great lot of fun choosing which ones to use when as I sewed. 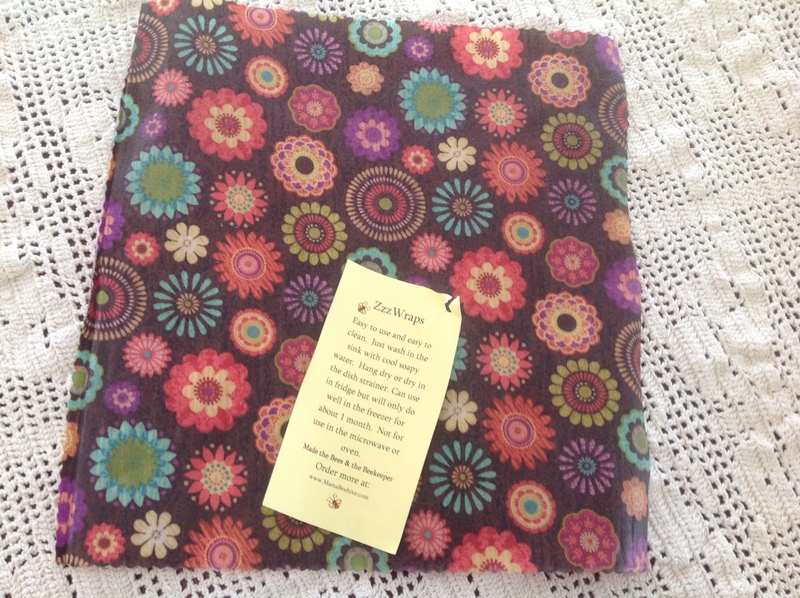 I had this kind of selection because I had a monthly C+S club order from Pink Castle Fabrics for about 2 years. I’m assuming you know by now that C+S will no longer have the 5 original designers who have now moved to Moda and are named the Ruby Star Society. Their first fabric offerings with Moda will be in the spring of 2019. I will also say that some of the new designers under the C+S name are interesting, especially Emi Oka, who is from Tokiname-shi, Aichi-ken, Japan. Anyway, here is a close up. I used the “Grande Hyancith” pantograph by Patricia Ritter. I’ve been wanting to use thisl pattern again. It’s curvy and dense, and it is adding more lovely texture to this quilt. I love the bee fabric on the back. Its from the Sarah Watts collection, Magic Forest. Bees are beloved in m;y family. My DIL Tami Enright runs the Bee Cause project that originated in South Carolina and that seeks to save the bees by placing them in places where they can thrive or where people can observe them and learn about them. She now has hives in all 50 states. See thebeecause.org for more information. 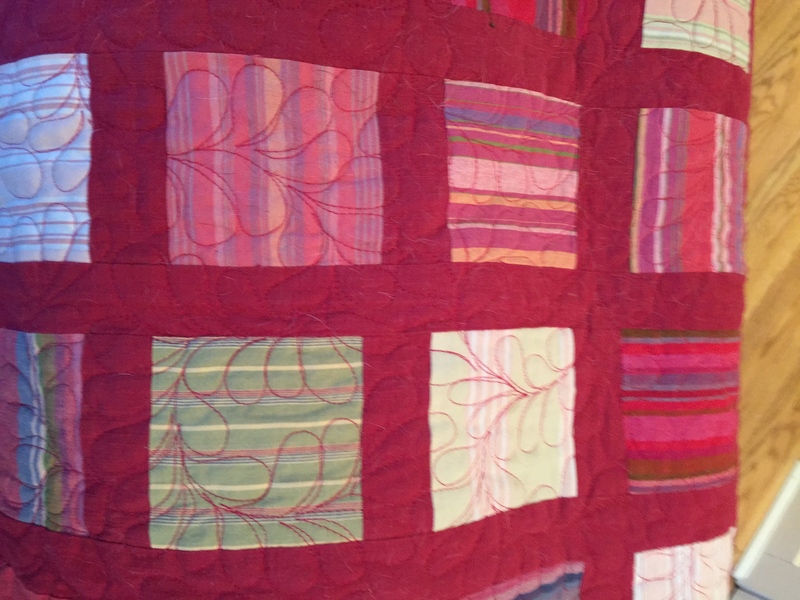 The binding and label are done in this lovely pinkish fabric, which is as soft as the quilt and which is giving more texture around the outside of the quilt—as the white slashes play against the pink. I am making a “cool” version, but with a different pattern, with the C+S low volume fabrics in blues, greens, and greys. I’m ironing and cutting fabric now, but have made some trial blocks. I can already see that I will love the “cool” quilt that emerges. I love having quilts made by my friends all around me. Every time I see one of those quilts, which is many times each day, I think of that person/those persons. And I feel all the loving energy that went into that piece of work. 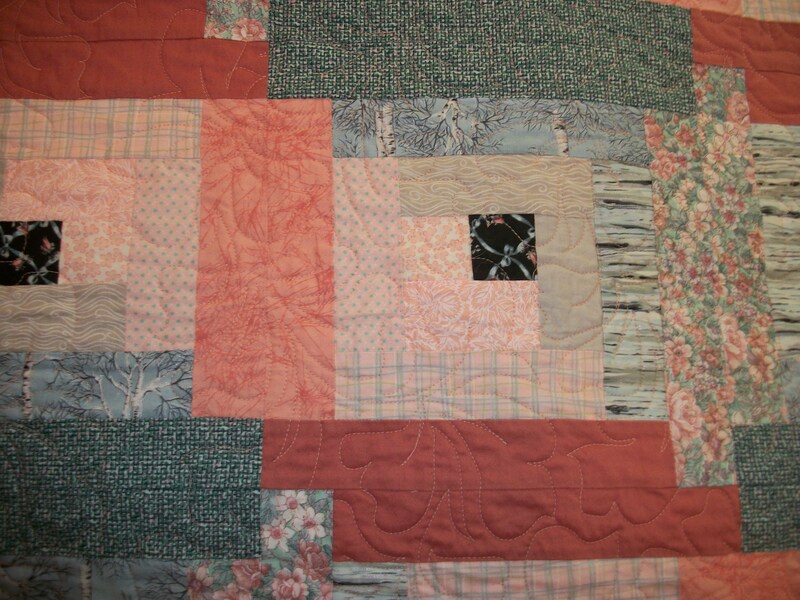 I bought this quilt top at a quilters’ auction in Virginia just before we moved to Maine. I thought it looked like Maine, and I love baskets. I quilted it the first winter we were here–2004-2005. It lives in my bedroom. Underneath it is an afghan made by my SIL Maryann Enright which lives on my bed most of the time. 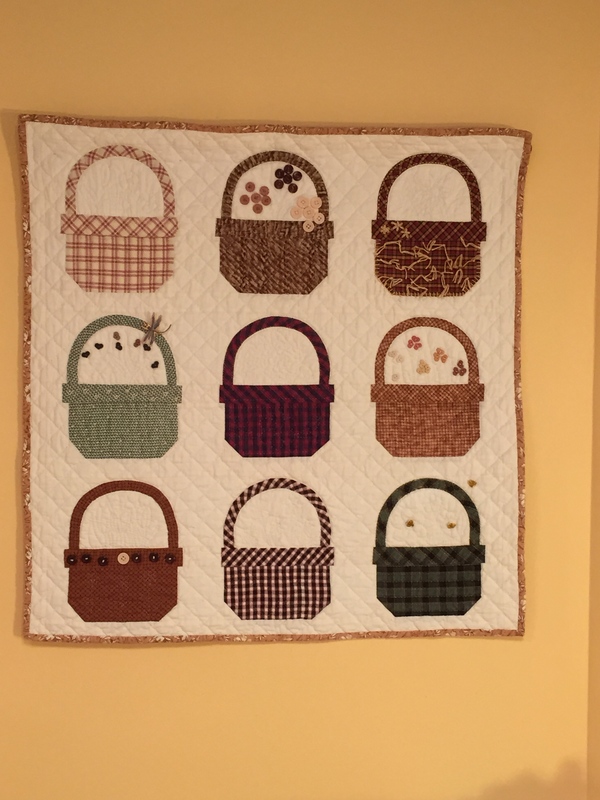 Roxanne Wells made this quilt, which hangs in my bedroom. 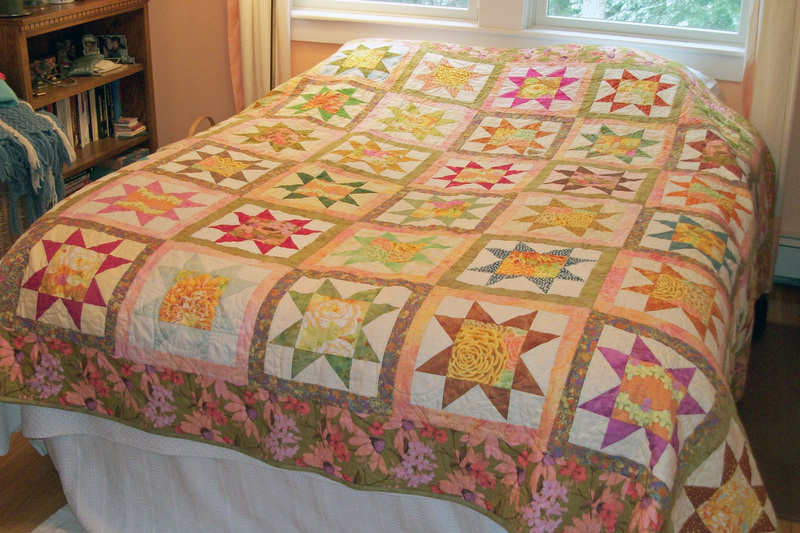 The Coastal Quilters made this quilt for John and me when he was so sick. 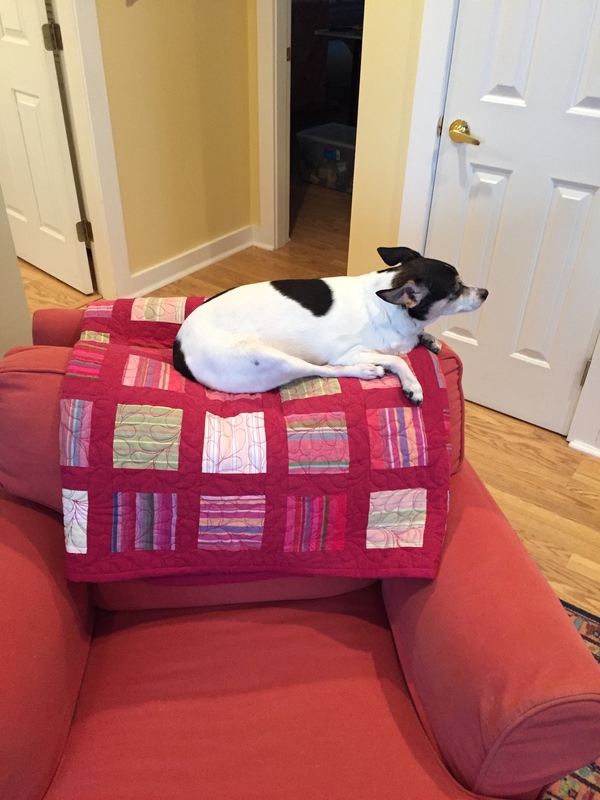 They said we needed a “quilting hug.” This picture is on my bed, but this quilt lives in the downstairs bedroom that we set up for him and that he never used. 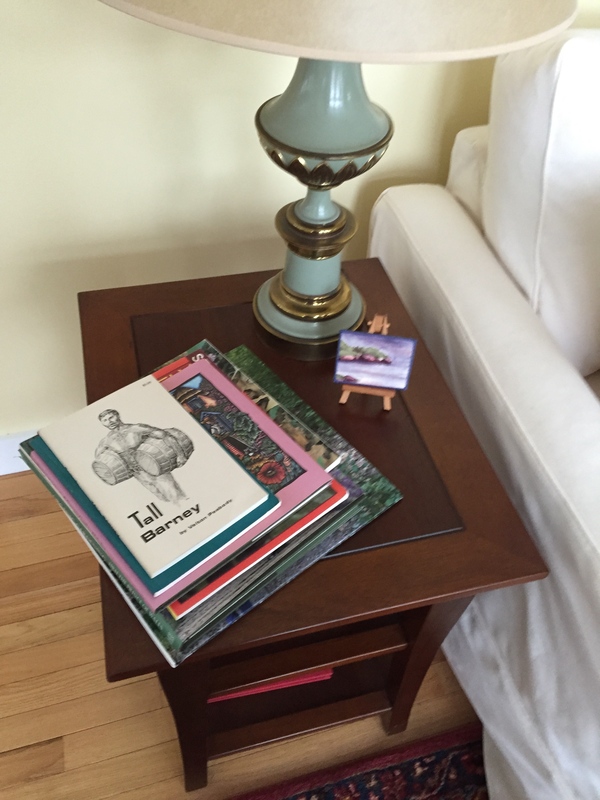 That room has been repainted and refurbished and is a favorite of many in the family. 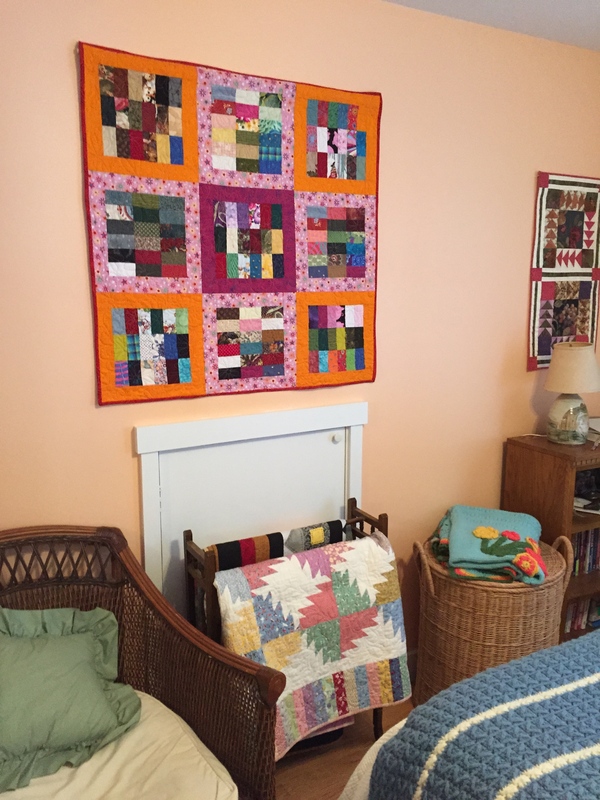 I am in and out of that room many times each day as its closet holds a lot of my quilting tools. 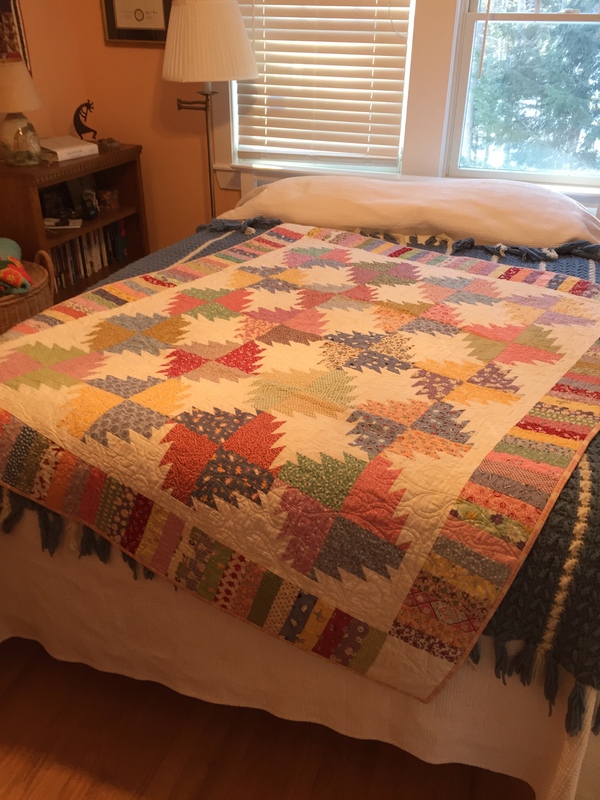 Gail Nicholson made this quilt, which has launched me on a quilt trip to put more quilts into the downstairs sitting/tv room/den? 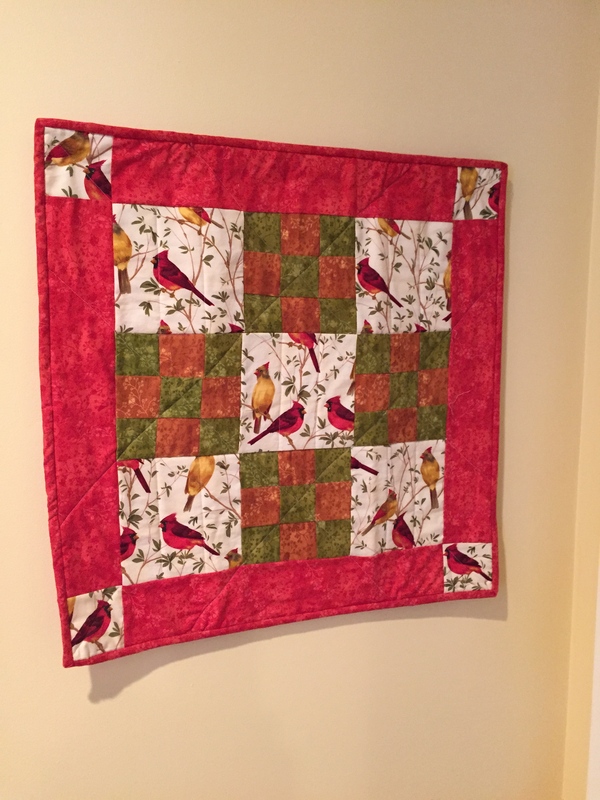 Joan Herrick quilted Gail’s quilt. Joan quilts free-hand on a long arm! 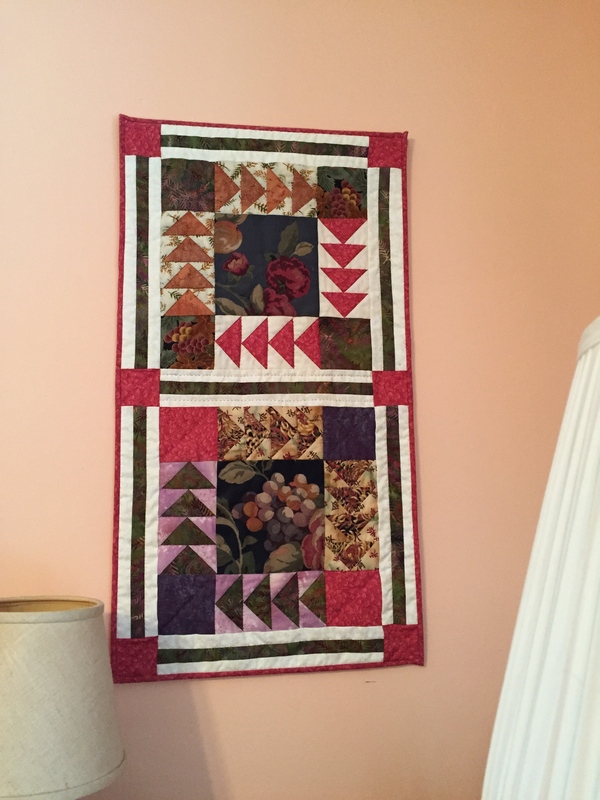 Milly Young made this quilt top, and I bought it at one of our auctions and finished it and fell in love with it along the way. I really need to use all these quilts more than I do now. I have always had a tendency to “save” things for “good.” But the point of a quilt is to USE THEM. So, this last one is coming downstairs TODAY to go into my sitting room project. 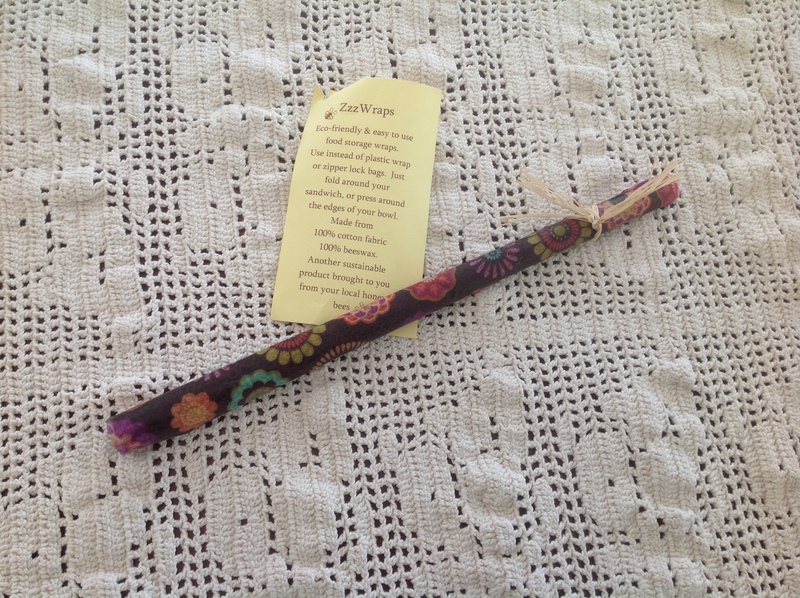 Here’s what I hope will be a very fun product–given to me by DIL Tami Enright, who is Director of The Bee Cause in South Carolina–a project of The Savannah Bee Company. This bees’ wax soaked fabric can seal a bowl or wrap a sandwich. Here’s what it looks like unfolded. It came from Mama Bee Hive, http://www.mamabeehive.com/index.php. But the present web site does not list this product. Perhaps a phone call to them if you are interested? So I have no idea what it costs. Apparently one just washes off the cloth and lets it dry and reuses.